for comparing technical or biological gels with 2D Western Blots of also different antibody signals. image of this membrane after blotting, focuses on the contour, alignment is identical to 2.
identical to contour image 4. We use the images 2. to 4. as support images for a fast and reliable warping, so the antibody signal can be directly transferred to the gel image. Here you can download our Getting Started Guide for 2D-Western-Blot projects. The Blotting Report, introduced in Delta2D 4.7, was adapted to the new 2D Western Blot project type and again improved in Delta2D 4.8. E.g. filtering from the Quantitation Table is now respected in the report. The job manager, already part of Delta2D for quite a while, is now better integrated with Delta2D's workflow, to quickly get done most of the work in the background and to keep an eye on its progress while staying focused on more important things. 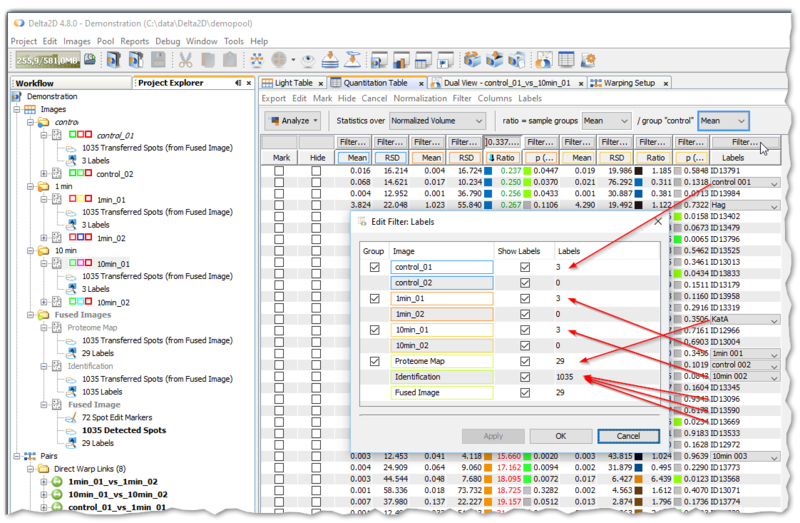 Another proven feature from Delta2D's early days on, Image Attributes, helps you to organize your images by assigning them to samples, gels and channels. While at first only being an organizing help, Image Attributes gained technical relevance when introducing the Internal Standard project type, also known as DIGE projects. Assinging images to a certain gel, sample and channel made it possible for Delta2D to allocate the different channels and the internal standard belonging to each gel correctly. With the new 2D-Western-Blot project types, the importance of correct sample-gel-channel-assignement now again grows. So we decided to make these assignments better visible. Now you can see at a glance how your images are organized and if everything is at its place. And to see details, simply hover with your mouse pointer few seconds above these symbols. Maintain arbitrary generic labels on specialized extra images, e.g. spot IDs, protein map, etc. The new "Labels" Column showing labels from all images of your project, even from those set to invisible. If a spot has multiple labels on multiple images, the topmost layer wins by default. suggested and reported by testers and users, and, of course, found by ourselves, to finally free your experience from any hassle. As usual, again we want to thank all of you who gave us feedback for your valuable comments. Your input enables us to make Delta2D better and better and to bring it closer to your needs. For a more comprehensive presentation of your analysis results we added the Blotting report in Delta2D 4.7. 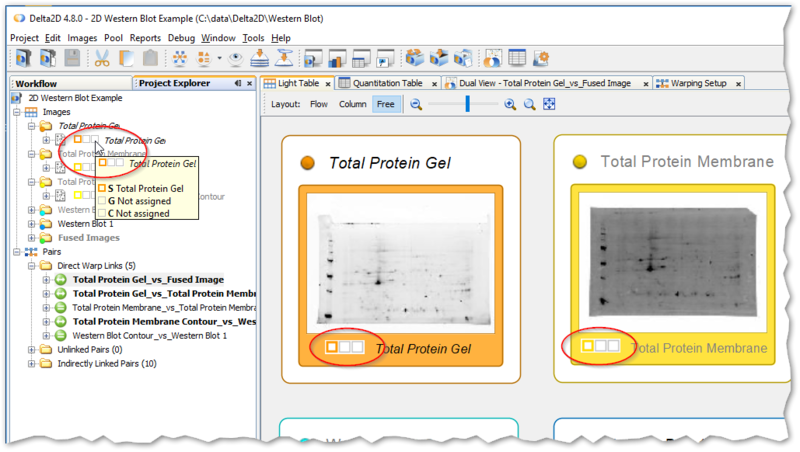 It extends the benefits of the known reports by an unique individual workflow for the comparison of 2D WB and 2DE gels. Want to select a number of labels and copy this selection to another image? No problem, Label Selection, Label Grouping and Label Translation are now available. Inspect complete expression profiles in 3D and enjoy enhanced web reports. Expression profile selection, hiding labels for hidden spots, hiding hidden images in barcharts, sortable tables in reports, improved defaults for statistics. 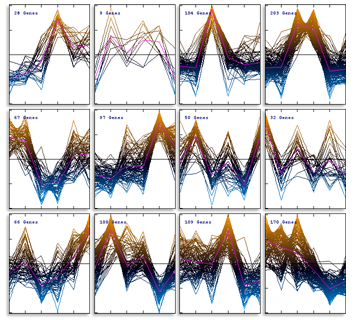 Improved statistics, combining hetereogeneous projects, easier data sharing, better automatic warping.